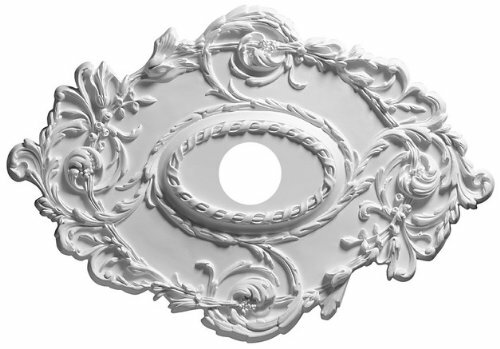 Decorative Ceiling Medallion - 23-7/8 Inches Wide This decorative medallion adds a bit of extra flair to your favorite ceiling light. It features a raised circle of large, curving petals interspersed with dainty acorns. A smooth layer balances the intricate pattern and separates it from a thin rope perimeter. 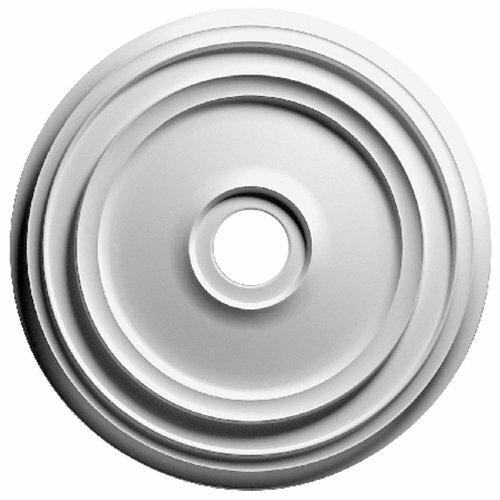 The disc is composed of lightweight polymer for easy installation, and the surface is unpainted so you can decide its future color. Center hole has a 4-inch diameter. 23.88 in x 1.12 in. 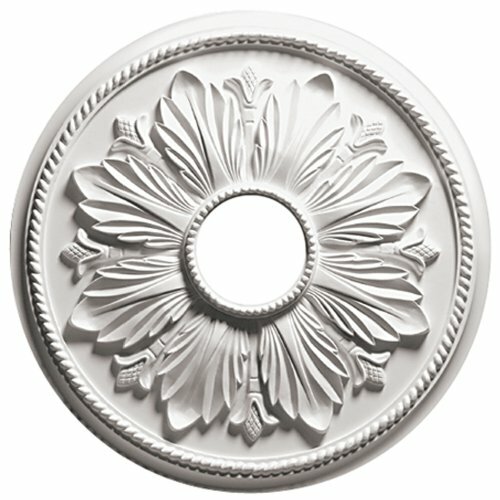 Focal Point Decorative Ceiling Medallion - 23-7/8 Inches Wide - White Resin Ceiling Light Accessory - 23.88 in X 1.12 In. When designing your home or business interior, don’t leave anything out. Focal Point Medallions are an easy and effortless way to extend your artistic eye from floor to ceiling. Accentuate light chandeliers or other fixtures with sophistication. The Quick Clips easy medallion installation system just takes a few simple steps. Just mark the anchor locations. Insert anchors and screws into the ceiling. Then align medallion keyholes and twist into place. In no time you have a beautiful piece accenting your living space. Focal Point’s beautifully crafted products are made of durable polyurethane, and feature crisp, impeccable detail that is unattainable with wood. Plus, builder friendly, single-piece designs reduce installation time and minimize callbacks. : At Focal Point Products, we are committed to quality, design and innovation. 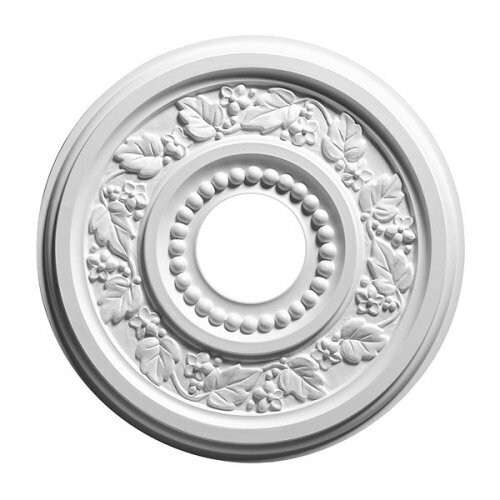 We offer hundreds of products including moldings, medallions, domes, niches, door systems and other architectural elements to help you design with distinction. 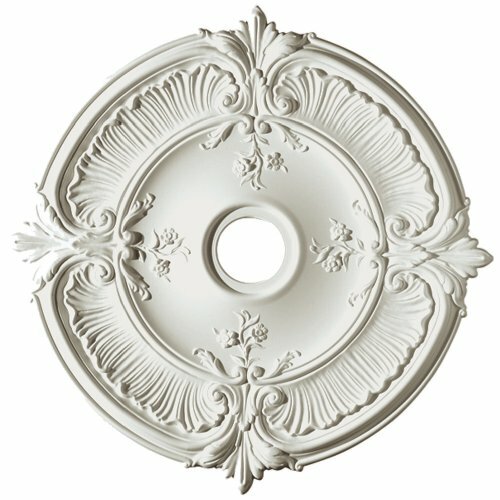 Package contains (1) Focal Point Acanthus Medallion in Primed White. Fast installation. No patching, sanding, or touch up required. Perfect for decorative finishes. No need to find studs. Decorative Medallion for Ceiling Lights - 24-5/16 Inches Wide Three raised rings are the decorative accents of this sleek ceiling medallion. It is a subtle addition to a minimalist or modern-styled room, its simple design blending into a decor focused on geometric shapes. Composed of a lightweight polymer, the medallion is easy to install. Has an unfinished surface and a 4 inch center hole. 24.31 in x 1.38 in. Focal Point Decorative Medallion For Ceiling Lights - 24-5/16 Inches Wide - White Resin Ceiling Light Accessory - 24.31 in X 1.38 In. When designing your home or business interior, don’t leave anything out. Focal Point Medallions are an easy and effortless way to extend your artistic eye from floor to ceiling. Accentuate light chandeliers or other fixtures with sophistication. The Quick Clips easy medallion installation system just takes a few simple steps. Just mark the anchor locations. Insert anchors and screws into the ceiling. Then align medallion keyholes and twist into place. In no time you have a beautiful piece accenting your living space. Focal Point’s beautifully crafted products are made of durable polyurethane, and feature crisp, impeccable detail that is unattainable with wood. Plus, builder friendly, single-piece designs reduce installation time and minimize callbacks. : At Focal Point Products, we are committed to quality, design and innovation. We offer hundreds of products including moldings, medallions, domes, niches, door systems and other architectural elements to help you design with distinction. 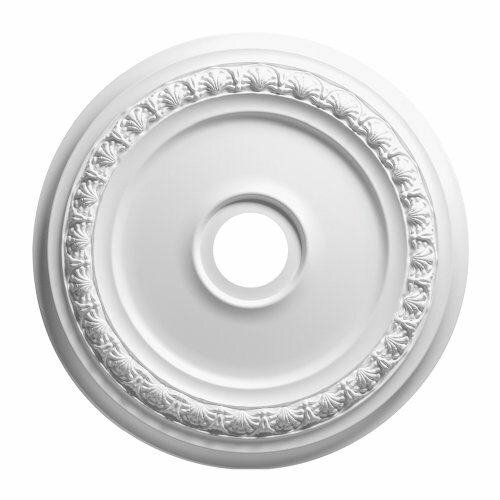 Package contains (1) Focal Point Rondel Medallion in Primed White. Fast installation. No patching, sanding, or touch up required. Perfect for decorative finishes. No need to find studs. 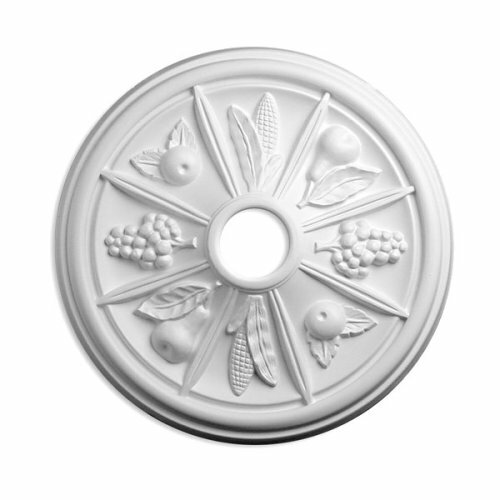 Beautify your home with Focal Points finely detailed ceiling medallions. Made of durable polyurethane with crisp, impeccable detail, these ceiling medallions can be painted, stained or faux finished to add the crowning touch to any room. Install them on your ceiling, around a light fixture, or as a decorative wall accent to bring a dash of architectural flair that wont be overlooked. 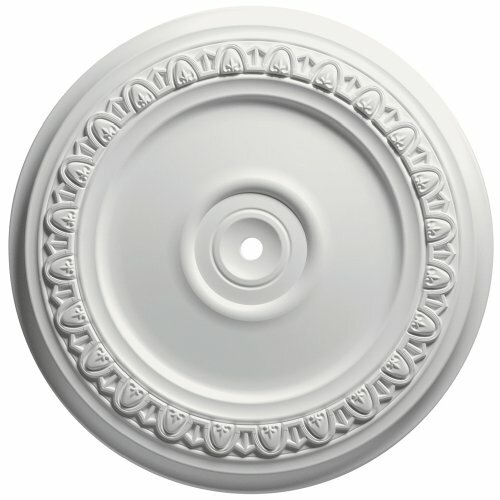 Paintable Ceiling Medallionï¿½- 24-3/8 Inches Wide Dainty shells and bell-shaped flowers trim the perimeter of this otherwise simply-styled ceiling medallion. A lightweight polymer material makes it easy to install, and an unfinished surface means you can choose to color the disc according to your decor. Makes for a charming accessory for your favorite ceiling light. 24.38 in x 1.62 in. 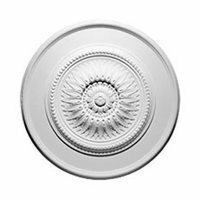 Focal Point Paintable Ceiling Medallionï¿½- 24-3/8 Inches Wide - White Resin Ceiling Light Accessory - 24.38 in X 1.62 In. 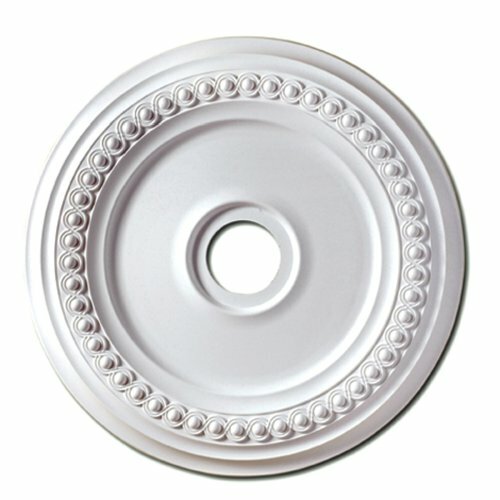 Compare prices on Focal Point Ceiling Medallions at LiveSaler.com – use promo codes and coupons for best offers and deals. We work hard to get you amazing deals and collect all avail hot offers online and represent it in one place for the customers. Now our visitors can leverage benefits of big brands and heavy discounts available for that day and for famous brands. We try to makes comparison shopping easy with Product Reviews, Merchant Ratings, Deal Alerts & Coupons. Find Deals, Compare Prices, Read Reviews & Save Money.